“Entrepreneurship and Career Camp” will be held at Final International University on 6-7-8 February. The entrepreneurship and career camp will be the most-attended one in our country and aims to help students, in their last year in high school, to shape their future and raise their self-awareness. 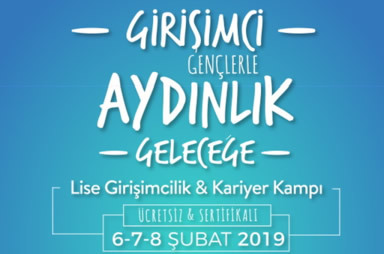 Students who are being educated in a high school in TRNC can register and attend the camp and they can meet up with many successful experts in the education and business fields as well as psychologists from Turkey and TRNC. During the camp, Final Schools Board of Director, Vice President of Board of Trustees of Final International University and Chairperson of TÖDER İbrahim Taşel, Chairman of the Executive Board of Başel Holding Burak Başel, Sabah Newspaper Educational Writer and ‘CNN Türk Başarıya Doğru’ Productor Sait Gürsoy, DreamTalk Founder and TEDx presenter Semih Yalman, Social Services Expert Barış Başel, Malpas Hotel General Executive Mert Bölükbaşı, Chairman of Administrative Board and General Director of Albank Ahmet Melih Karavelioğlu, Education Expert and Okan University Candidate Relationship Director Servet Gülsün Şirin, Psychologist Writer Prof. Dr. A. Kadir Özer, Technology Expert and Lala Eğitim Founder Furkan Taşel will get together with students. Educator Emrah Adaklı will be the program moderator for the camp. Besides the talk shows, personality inventory tests, tests related to choice of profession, SWOT analysis, information and technology initiatives, career goal workshops and many more activities will be carried out in order to assist students to decide on their tendencies.